Brian Todd of the Food Institute will look at the trends among the transactions tallied by the association in 2018, driven largely by retailers, which bounced back from a slow year in 2017. He will determine what the hotspots are and what might be coming down the road. David Schoeder of The Food Partners will take a look at out how the supermarket landscape is changing as result of all of this activity and what the future may bring for food retailers over the next year. Karen Martin of BMO Capital Markets will discuss the current M&A market conditions for warehouses and other food industry companies, reflecting on recent transactions, as well as the status of the equity and debt markets, and other industry conditions. Sponsored by: BMO Harris Bank Food, Consumer and Agribusiness Group Whether you’re a producer, processor, retailer or distributor, every company throughout the food continuum needs a financial partner that understands the factors that can impact their business. From commodity price fluctuations to industry cyclicality, our experienced team of specialists understands how these factors affect your business, and we’re dedicated to serving the needs of the entire food industry – from farm to consumer. To learn more about how we can help, visit http://bmoharris.com/food. David Schoeder has over 30 years of investment banking experience within the food industry specializing in acquisitions, divestitures, debt restructuring, private placement, and strategic advisory services. He is also a leading national expert on capitalization and governance issues relating to cooperatives and private companies. In addition, he has extensive experience with the installation of ESOP’s for companies in the food sector. Prior to founding TFP, he served as managing director at both KPMG Retail Ventures and the Cooperative Funding Corp., the investment banking affiliate of National Cooperative Bank. Karen is a Managing Director in BMO Capital Markets’ Mergers & Acquisitions Group, specializing in the Food industry. For 25 years, she has focused on mergers and acquisitions and corporate finance for public and private companies. Karen has advised clients in various sectors of the food retail, including grocery and convenience, and food wholesale industries. Karen has executed transactions spanning outright sales, acquisitions, take-over defense, recapitalizations, carve-outs and general advisory. Prior to joining BMO Capital Markets, Karen was with Banc One Capital Markets, Inc. for ten years where she specialized in mergers and acquisitions and corporate finance. Karen has an MBA from the University of Chicago Booth School of Business and a Bachelor of Arts from DePauw University. Brian became president of The Food Institute in 2002 and has worked for this non-profit, founded in 1928, since 1980. Brian has been interviewed on consumer and food industry trends on a number of television programs, including Fox News, The Today Show, NBC News, the CBS Evening News and the PBS Nightly Business Report, and quoted in publications ranging from The Wall Street Journal and New York Times to Supermarket News, Progressive Grocer and Food Processing Magazine. He has also been a frequent guest on various public radio programs discussing food prices, mergers & acquisitions, and other industry issues. Brian graduated from Ramapo College in Mahwah, NJ with a B.A. in Political Science and also holds a Masters in Administrative Science from Fairleigh Dickinson University. Brian Todd of the Food Institute will look at the trends among the transactions tallied by the association in 2018, driven largely by retailers, which bounced back from a slow year in 2017. He will determine what the hotspots are and what might be coming down the road. David Schoeder of The Food Partners will take a look at out how the supermarket landscape is changing as result of all of this activity and what the future may bring for food retailers over the next year. Karen Martin of BMO Capital Markets will discuss the current M&A market conditions for grocery retail and other food industry companies, reflecting on recent transactions, as well as the status of the equity and debt markets, and other industry conditions. Brian Todd of the Food Institute will look at the trends among the transactions tallied by the association in 2018, driven largely by retailers, which bounced back from a slow year in 2017. He will determine what the hotspots are and what might be coming down the road. 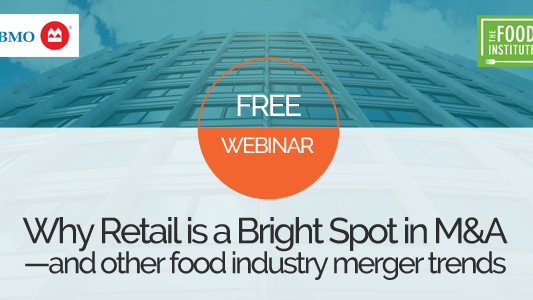 David Schoeder of The Food Partners will take a look at out how the supermarket landscape is changing as result of all of this activity and what the future may bring for food retailers over the next year. Karen Martin of BMO Capital Markets will discuss the current M&A market conditions for grocery retail and other food industry companies, reflecting on recent transactions, as well as the status of the equity and debt markets, and other industry conditions. Sponsored by: BMO Harris Bank Food, Consumer and Agribusiness Group Whether you’re a producer, processor, retailer or distributor, every company throughout the food continuum needs a financial partner that understands the factors that can impact their business. From commodity price fluctuations to industry cyclicality, our experienced team of specialists understands how these factors affect your business, and we’re dedicated to serving the needs of the entire food industry – from farm to consumer. To learn more about how we can help, visit http://bmoharris.com/food. Outstanding speakers, very well ran webex. Brian Todd of the Food Institute will look at the trends among the transactions tallied by the association in 2018, driven largely by retailers, which bounced back from a slow year in 2017. He will determine what the hotspots are and what might be coming down the road. David Schoeder of The Food Partners will take a look at out how the supermarket landscape is changing as result of all of this activity and what the future may bring for food retailers over the next year. Karen Martin of BMO Capital Markets will discuss the current M&A market conditions for warehouses and other food industry companies, reflecting on recent transactions, as well as the status of the equity and debt markets, and other industry conditions.